The Welch Allyn ScanTeam ST 2010-1 has been renamed to the Honeywell ScanTeam ST 2010-1. 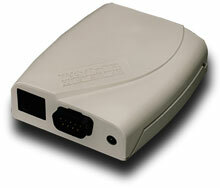 The 2010 is an economical solution for a wide range of Keyboard wedge and serial RS-232 system interface requirements. It is designed to meet the functionality of other entry level wedge decoder products but will provide the additional Handheld Products brand value of a fully programmable editor-formatter with barcode and magnetic stripe decoding. As an added benefit the scanner input port can accept serial RS-232 data from an external peripheral device.The ST2010 product utilizes FLASH memory for all program and parameter storage. This memory may be reprogrammed in the field by end users or integrators using the QuickLoad utility program. A low cost high quality solution the ST2010 offers the most value of any product in its class.